High prices of metals, oil and natural gas have led to increased activity of TNCs in extractive industries. The involvement of TNCs in extractive industries has had a chequered history. In the early twentieth century, these industries accounted for the largest share of FDI, reflecting the international expansion of firms from the colonial powers. With a growing number of former colonies gaining independence after the Second World War, and the creation of the Organization of the Petroleum Exporting Countries (OPEC), the dominance of these TNCs declined, as did the share of extractive industries in global FDI. From the mid-1970s, in particular, the share of oil, gas and metal mining in world FDI fell steadily as other sectors grew much faster. However, as a result of rising mineral prices, the share of extractive industries in global FDI has recently increased, although it is still much lower than those of services and manufacturing. It is therefore an opportune time for the WIR07 to revisit the role of TNCs in extractive industries and their impact on development. Global mineral markets are characterized by an uneven geographical distribution of reserves, production and consumption. Some developing and transition economies are among the main producers and net exporters of various minerals, while developed countries and fast-growing emerging economies are the major consumers and importers. These imbalances sometimes create concerns among importing countries over the security of supply, and concerns among exporting countries over market access. The supply of minerals is essential for economic development: no modern economy can function without adequate, affordable and secure access to these raw materials. TNCs can be important for both host and home countries in this context. For countries that lack the necessary indigenous capabilities for transforming their natural resources into commercial goods, TNCs can bring the needed capital, knowledge and access to markets; for home countries, they can serve as vehicles for securing access to foreign supplies. Indeed, some of the world’s largest TNCs are active in extractive industries, and a number of new ones have emerged in resource extraction in the past decade, not least from developing and transition economies. The overseas expansion of TNCs from the South is reflected in FDI data. Between 2000 and 2005, the aggregate share of developed countries in global FDI in extractive industries fell from 99% in 2000 to 95% in 2005. Both government policies and TNCs’ investment decisions are influenced by the volatility of mineral markets. The current price boom reflects in part a surge in demand for oil, gas and various metallic minerals, especially from some rapidly growing developing economies, notably China. Although by June 2007, prices of commodities such as aluminium, copper, gold and oil remained close to their highest levels in nominal terms, their future trends are difficult to forecast. However, experts agree that the costs of exploiting new mineral deposits are likely to rise, which might keep prices at relatively high levels in the coming years. The high prices have spurred an investment boom in mineral exploration and extraction. For example, global private investment in non-ferrous metal exploration rose from $2 billion in 2002 to an estimated $7 billion in 2006, and drilling for oil and gas doubled over the same period, pushing the rig utilization rate up to about 92%. Developed countries still attract the bulk of FDI in extractive industries, partly explained by significant cross-border M&A activity. 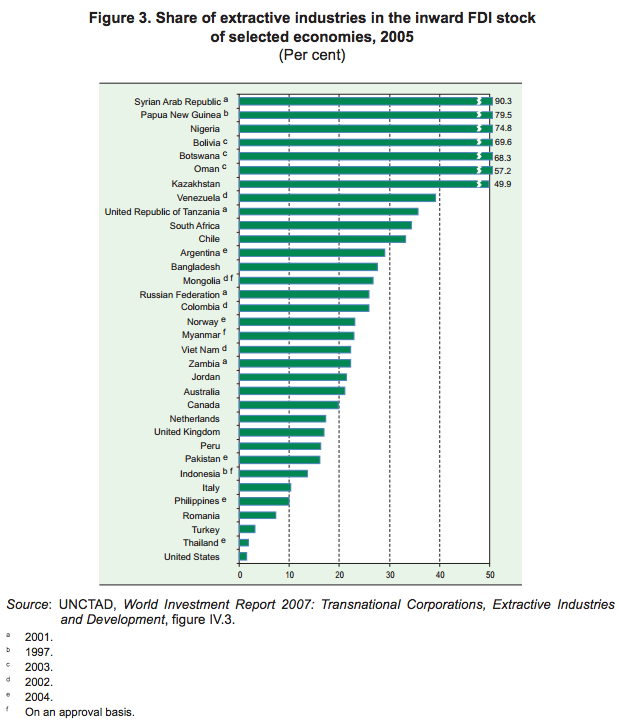 However, their share in global inward FDI in these industries fell from about 90% in 1990 to 70% in 2005. The share of developing and transition economies as destinations for TNC investments in extractive industries has increased over the past two decades. Between 1990 and 2000, their estimated combined stock of inward FDI in those industries more than doubled, and between 2000 and 2005, it increased again by half. Following new mineral discoveries, a number of new FDI recipients have emerged, including LDCs such as Chad, Equatorial Guinea and Mali. During this period, the Russian Federation and other CIS members also became important destinations for FDI in extractive industries. 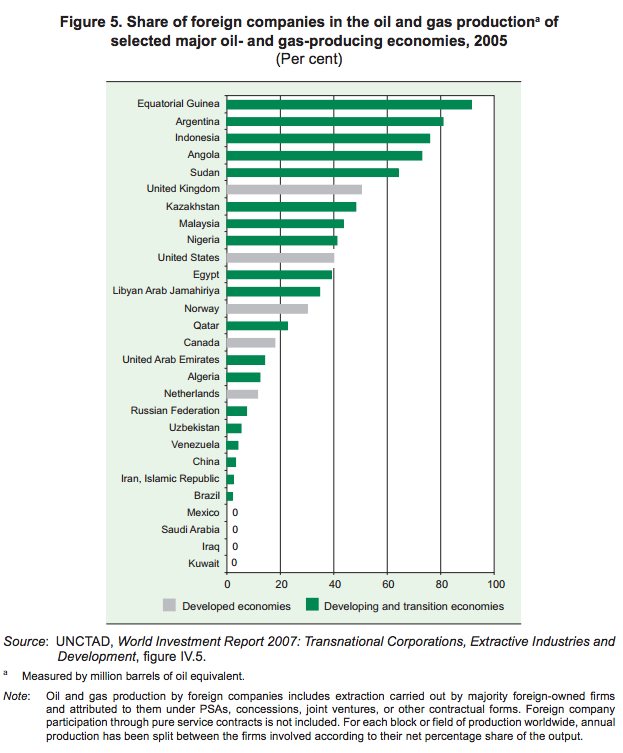 The importance of extractive industries in inward FDI varies by host economy. 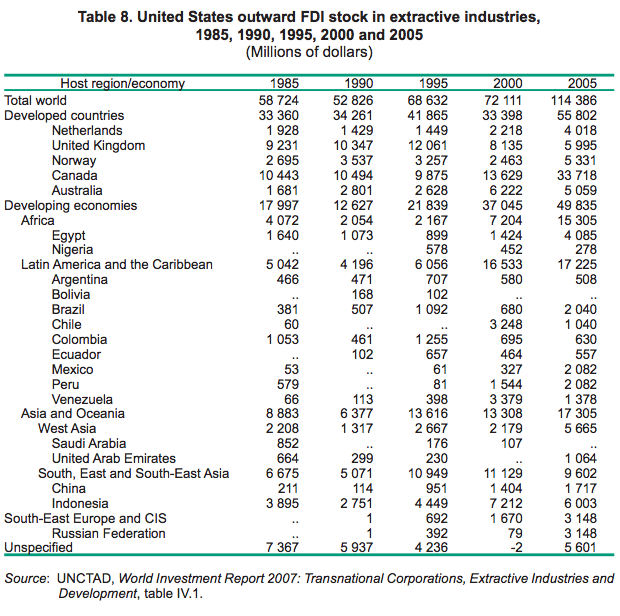 In all the major country groups, the extractive industries of some countries account for a significant share of the total inward FDI stock: for example, Australia, Canada and Norway among developed countries; Botswana, Nigeria and South Africa in Africa; Bolivia, Chile, Ecuador and Venezuela in Latin America and the Caribbean; and Kazakhstan in South-East Europe and the CIS (figure 3). In a number of lowincome, mineral-rich countries, extractive industries account for the bulk of inward FDI; many have few other industries that can attract significant FDI, due to their small domestic markets and weak production capabilities. The relative importance of foreign companies in the production of metallic minerals and diamonds varies considerably by country. Foreign affiliates account for virtually all of the (non-artisanal) production in LDCs such as Guinea, Mali, the United Republic of Tanzania and Zambia, as well as in Argentina, Botswana, Gabon, Ghana, Mongolia, Namibia and Papua New Guinea (figure 4). In these countries, TNCs generally operate through concessions granted in the form of exploration and mining licences. In another 10 major metal-producing countries, foreign affiliates account for an estimated 50% to 86% of production. By contrast, in the Islamic Republic of Iran, Poland and the Russian Federation their share is negligible. In oil and gas, foreign affiliates generally account for a lower share of production than in metal mining. In 2005, they were responsible for an estimated 22% of global oil and gas production, with the average share being higher in developed countries (36%) than in developing countries (19%) and transition economies (11%). However, there was wide variation among developing countries. In West Asia, foreign affiliates’ output amounted to an average of only 3% of production, whereas the corresponding share in sub-Saharan Africa was 57% on average. Foreign companies accounted for more than half of production in Angola, Argentina, Equatorial Guinea, Indonesia, Sudan and the United Kingdom. On the other hand, no production was attributed to foreign affiliates in, for instance, Kuwait, Mexico and Saudi Arabia (figure 5). … reflecting a diverse and changing universe of extractive industry TNCs, with the dominance of privately owned firms in metal mining and of State-owned enterprises in oil and gas. The relative importance of TNCs in the production of metallic minerals and of oil and gas varies considerably. 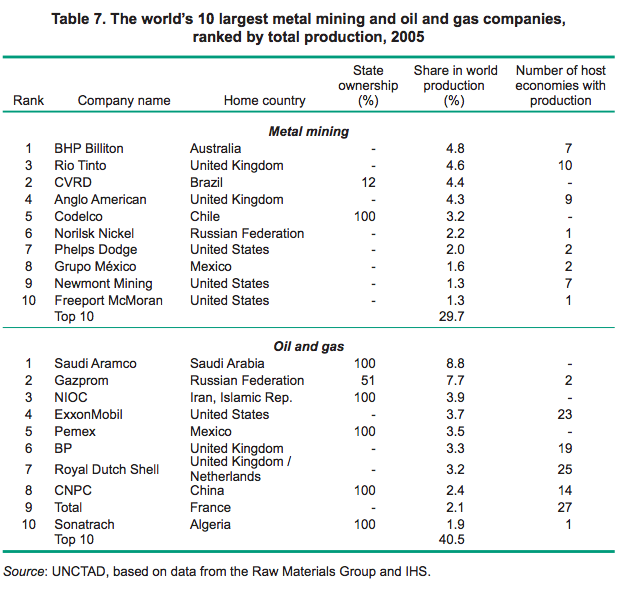 In metal mining, 15 of the 25 leading companies in 2005, ranked by their share in the value of world production, were headquartered in developed countries (see table 7, which lists the top 10 TNCs). Eight others were from developing countries and the two remaining were from the Russian Federation. The top three were BHP Billiton (Australia), Rio Tinto (United Kingdom) and CVRD (Brazil). Three State-owned companies also featured on the list: Codelco (Chile), Alrosa (Russian Federation) and KGHM Polska Miedz (Poland). Following CVRD’s acquisition of Inco (Canada), it was estimated to have become the largest metallic mineral producer in the world in 2006 – the first time that a Latin America-based company will have occupied that position. The level of internationalization of these leading companies varies greatly. In 2005, Rio Tinto had mining operations in the largest number (10) of host countries, followed by Anglo American, AngloGold Ashanti and Glencore International. In contrast, large producers like Codelco, CVRD and Debswana (Botswana) had no overseas mining production. In oil and gas, private companies remain the largest corporations in terms of foreign assets. For example, 10 of them were included among the firms on UNCTAD’s list of the world’s top 100 TNCs (by foreign assets) in 2005. In terms of production, however, TNCs from developed countries no longer rank among the largest companies in the world. In 2005, the world’s three largest oil and gas producers were all State-owned enterprises based in developing or transition economies: Saudi Aramco (Saudi Arabia), Gazprom (Russian Federation) and the National Iranian Oil Company. Saudi Aramco’s annual production in 2005 was more than double that of the largest privately owned oil and gas producer, ExxonMobil (United States). More than half of the top 50 producers were majority State-owned, 23 had their headquarters in developing countries, 12 in South-East Europe and the CIS, and the remaining 15 in developed countries. Although State-owned companies based in developing and transition economies control most of the global production of oil and gas, their degree of internationalization is still modest compared with that of the top privately owned oil TNCs. Indeed, none of the top three State-owned producers had significant foreign production in 2005, whereas foreign locations accounted for 70% of the production of the top three privately owned oil majors. However, some companies from developing and transition economies are expanding their overseas interests, and are fast becoming global players. The combined overseas production of CNOOC, CNPC, Sinopec (all China), Lukoil (Russian Federation), ONGC (India), Petrobras (Brazil) and Petronas (Malaysia) exceeded 528 million barrels of oil equivalent in 2005, up from only 22 million barrels 10 years earlier. China’s CNPC, Sinopec and CNOOC, and India’s Indian Oil Corporation and ONGC Videsh have invested large sums in oil and gas production deals around the world during the past two years. Both CNPC and Petronas are involved in oil and gas production in more than 10 foreign countries. A few State-owned oil TNCs from emerging economies have invested in host countries that developed-country TNCs are less likely to operate in, for a variety of reasons, including sanctions. In metal mining, the top 10 companies account for a growing share of global production. Following a series of cross-border M&As, the 10 largest metal mining companies in 2006 controlled an estimated 33% of the total value of all non-energy minerals produced globally, compared with 26% in 1995. Concentration levels are even higher for individual metals. In the case of copper, for example, the top 10 companies accounted for 58% of world production in 2005. Conversely, in the oil and gas industry, the level of concentration has remained fairly stable over the past decade, with the top 10 producers accounting for about 41% of world production. Varying motives drive the overseas expansion of different TNCs. The drivers and determinants of investments by extractive-industry TNCs differ between activities, industries and companies. Natural-resource-seeking motives dominate FDI and other forms of TNC involvement in upstream (exploration and extraction) activities. A TNC might seek resources to meet its own needs for its downstream refining or manufacturing activities, to sell the minerals directly in host, home or international markets, or to secure the strategic requirements of its home country (as formulated by the country’s government) for energy or other minerals. The latter has been a major driver of the recent overseas expansion of State-owned TNCs from Asia, for instance. Market-seeking motives figure mainly among the drivers of overseas downstream activities. For example, Russian TNCs in extractive industries have invested abroad to enhance control over distribution channels linked to those activities, and Saudi and Kuwaiti State-owned oil companies have partnered with the Chinese firm Sinopec in two separate refining and petrochemical ventures in China. Efficiency-seeking motives apply mainly to investments in the processing or early metal manufacturing stage, where TNCs seek to exploit differences in costs of production between countries. Strategic asset-seeking motives can be linked especially to the rise of cross-border M&As in various extractive industries and activities: companies may invest to acquire strategic assets in the form of know-how and technology from other companies or from specialized technology providers, or to speed up their rise to global status by accessing the resources, capabilities and markets of the acquired firms. Access to financial resources is an advantage over domestic firms in host countries, enjoyed by both traditional and new TNCs. International experience with extractive projects may increase the ability of TNCs to borrow or raise funds through stock markets. Financial strength can also be linked to home-country institutional arrangements. State-owned TNCs from some emerging economies benefit from financial backing by their governments, which may enable them to assume greater risks when investing abroad and to pay more for access to mineral resources. With some important exceptions, proprietary technology is of relatively limited importance as an ownership-specific advantage for the internationalization of most extractive-industry firms. Technologies used in most metal mining operations and oil and gas extraction are well known today, and can be obtained in the open market. Important exceptions include technologically challenging projects, such as those related to deep offshore drilling, and production of liquefied natural gas and development of unconventional energy sources. However, expertise in managing long-term projects and the associated risks remains critical for successful overseas expansion. Access to markets and to transportation and distribution channels are other potentially important firm-specific advantages, at least in the case of oil and gas. Mineral endowments provide opportunities for economic development and poverty alleviation in the countries where they are located. Indeed, some of today’s developed countries as well as a number of developing countries have successfully leveraged their mineral resources for accelerating their development process. In other cases, however, the impact of extractive activities has been and remains disappointing. For many mineral-exporting countries, the current commodity price boom has led to improved terms of trade. This applies in particular to many low-income countries, where revenues from mineral exploitation and exports represent a large share of their national income. But natural resource endowments do not translate automatically into development gains for a country, with or without TNC involvement in the extraction process. There are many underlying determinants of the performance of resource-rich countries that are related to the global forces of demand and supply and to policy failures rather than to TNC participation per se. Nevertheless, TNCs can influence the outcome. They may complement domestic investment and boost production by contributing capital, technology and management skills. Such a package of assets is generally needed the most in low-income countries that lack domestic capabilities. On the other hand, reliance on TNCs may also raise concerns associated with unequal bargaining strengths, ownership and control over non-renewable resources, rentsharing, transfer pricing practices and various environmental and social costs. Thus TNC involvement in extractive industries may have both positive and negative economic, environmental, social and political impacts on a host country. Considerable efforts to address these issues are necessary for harnessing the earnings from extractive industries to boost development. The economic challenge for a host country is threefold: how to add value through extractive activities, how to capture that value locally, and how to make the best use of the revenues generated. In terms of adding value, the benefits of TNC involvement vary by country. Developing countries that possess sufficient financial resources, engineering expertise and technically competent State-owned oil companies have successfully developed their own capabilities to exploit their natural resources. West Asia is a typical example, where much of the oil and gas extraction is undertaken with known technology and little participation by foreign companies. In many other countries that lack the finance and ability to manage capital-intensive, high-risk and sometimes technologically challenging projects, TNC participation has helped boost their output and exports of minerals. While there are alternatives to TNCs for accessing funds, such sources may not be available to domestic enterprises in all countries. An advantage of involving TNCs in the financing of a mining project is that it does not generate foreign debt for host-country governments, and such financing comes with a bundle of other assets, such as technology and managerial expertise. For some extraction projects, access to technology and management know-how can indeed be a reason for countries to rely on TNCs. But TNC involvement comes at a price. TNCs may claim a significant share of the revenue generated and repatriate a certain proportion of their profits, thereby affecting the sharing of the value created. TNC involvement also affects the second part of the economic challenge: capturing the value locally in the form of employment and wages, local procurement, and government revenue in the form of taxes, royalties or dividends. Large-scale mineral extraction generally offers limited employment opportunities, and hence has little impact on employment, at least at the macro level. This applies especially to projects involving TNCs, as these companies tend to use more capital-intensive technologies and processes than domestic enterprises. The scope for backward linkages is generally relatively small in extractive industries. In addition, foreign affiliates are more likely to use foreign suppliers of various inputs. In low-income countries, a lack of qualified suppliers and skills shortages can also reduce the scope for local sourcing as well as downstream processing. Thus the potentially most important direct contribution from mineral extraction is the rise in host-country income, much of which takes the form of government revenue. 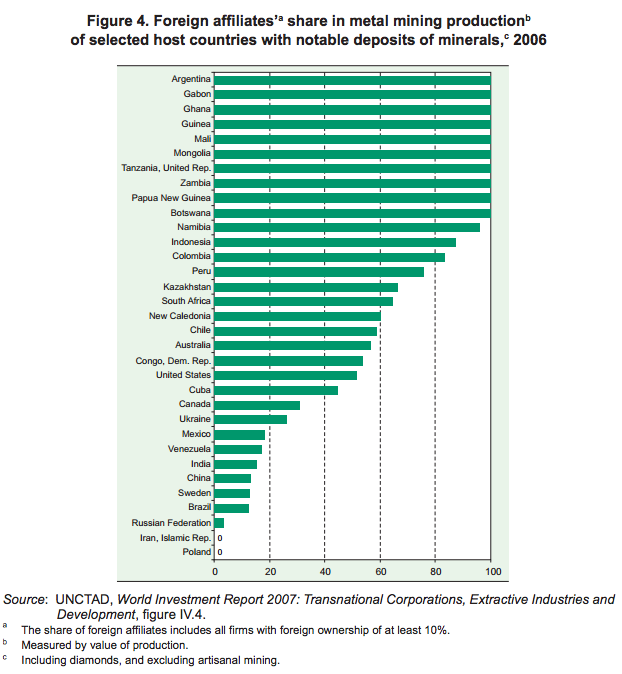 The amount of net revenue and income generated for the host country from TNC operations in extractive industries depends both on the extent of the overall value created by their participation, and how that value is shared between the TNC on the one hand, and host-country factors of production and the government on the other. In general, the better the capabilities and competitive strengths of a country’s domestic enterprises, the more choice that country has for project financing and implementation. In countries with limited domestic capabilities, relying on TNCs may well be the only viable option to transform dormant resources into commercial products. The sharing of revenue from a project partly reflects the relative bargaining power of host governments vis-à-vis transnational firms, which influences the terms and conditions they can impose for the participation of the latter. The sharing of revenue is also influenced by TNC conduct, including their accounting practices, financial behaviour, the possible use of transfer pricing and the repatriation of a certain proportion of their profits. Various studies of fiscal regimes suggest that the government’s take in revenues generated from oil and gas activities over the lifetime of a project vary between 25% and 90%, and in metal mining between 25% and 60%. However, empirical information on TNCs’ tax payments on a country-specific basis is scarce, making enhanced transparency important. There can also be various potential indirect economic impacts from TNC involvement. First, the entry of TNCs can constitute an important channel for knowledge and technology transfer to developing countries. However, the lack of educated and skilled human resources and of absorptive capacity in general can limit the positive effects on low-income countries of such knowledge transfers. Another potential indirect economic effect is linked to investments in infrastructure. TNC activities in extractive industries are often associated with the development of public utilities (such as electricity and water supplies) and with the building of the transportation infrastructure (roads, railways and ports) needed for extracting, transporting and exporting the minerals and fuels. If the new infrastructure is developed in populated areas, it is likely to provide greater benefits than if developed in more remote areas of a country. The third part of the economic challenge is not directly linked to TNCs. Ultimately, the overall development impact of the revenue generated is determined by the way in which the revenues generated for the host country are managed, distributed and used by the government, and to what extent they support the development objectives and needs of both current and future generations. By enabling or boosting production, TNCs may influence the overall economic performance of a host country in terms of its macroeconomic stability, growth and income distribution. Whereas most of these impacts relate to extractive activities in general, the income generated through TNC involvement can help overcome initial hindrances to economic growth (such as low levels of savings and investment) and give it a big push. At the same time, a booming extractive industry, with or without TNC participation, can also have distorting effects, commonly referred to as the “Dutch disease”, especially if windfall gains are not managed carefully and in accordance with long-term development strategies. Thus, even if TNC participation contributes to economic growth, for it to generate substantial development gains the benefits obtained need to be wisely used and equitably distributed. … as well as considerable environmental, social and political impacts. Extractive activities, regardless of who undertakes them, involve environmental costs. TNCs can play both a negative and a positive role in this context. On the one hand, they may add to environmental degradation in a host country simply by participating in resource extraction where there would otherwise be none. On the other hand, they may reduce adverse environmental consequences by using more advanced technologies in production, and by applying and diffusing higher standards of environmental management than domestic companies, where the latter – including artisanal and small-scale mining – exist. However, the net environmental impact of TNC activities is determined to a significant extent by a host-country’s environmental regulations and its institutional capacity to implement them. In recent years, there has been growing environmental awareness among large, established TNCs in both metal mining and oil and gas extraction. While accidents and bad practices undoubtedly still occur, their environmental practices have generally improved over the past decade or so, although these vary by company. For example, TNCs originating from home countries where environmental legislation is at a nascent stage may be relatively less well equipped to manage the environmental consequences of their overseas projects than those from countries with more advanced environmental legislation and standards. More than in other industries, investment in extractive activities can also have far-reaching social and political consequences; the outcome depends largely on the specific host-country situation. Negative social and political impacts have been observed mainly in mineral-rich poor countries with weak institutions. Problems are often associated with particular minerals, poor governance frameworks, and weak institutional capacities of host governments to formulate and implement laws and regulations. Among various social concerns, health and safety in the extractive industries have consistently posed a challenge, particularly in artisanal mining in developing countries. However, problems also exist in some projects operated by major TNCs. Other concerns may arise from the relationship between TNCs and local communities, the influx of migrants to work in TNC-operated projects and related issues. Political problems may stem from disputes over the distribution of the resource revenues, corruption, and even armed conflict or war among different groups seeking to benefit from the revenues generated. TNC participation can introduce higher standards in dealing with various social issues, but it can also add to problems. By their mere presence, they may – directly, indirectly, or unwittingly – support or strengthen the existing order. When mineral deposits are known to exist in weakly governed or authoritarian States, companies need to consider carefully whether or not to operate in those locations. The quality of government policies and institutions is a determining factor for ensuring sustainable development gains from resource extraction, with or without TNC involvement. The management of a mineral-based economy is complex, and requires a well-developed governance system and well-considered national development objectives. In some mineral-rich developing countries, however, government policy-making may be aimed at short-term gains rather than long-term development objectives. Furthermore, the distribution and use of a host country’s share of mineral revenues may be determined with little attention to development considerations. In some cases, easy access to revenues from mineral resources can make governments less accountable to their populations, and more inclined to preserve and extend the interests of a small governing elite. These factors underline the importance of developing a legal system based on the rule of law, as well as an institutional environment in which companies have incentives to invest in productive activities. The quality of the physical infrastructure, education and health care also influences investment decisions. Moreover, proactive policies aimed at using government revenues from extractive industries to achieve development goals are essential for ensuring social cohesion; indeed, large increases in revenues can cause social disruptions and political instability if they are not channelled and managed carefully. Beyond the overall framework, appropriate sectoral institutions and policies are needed, including a legal and administrative framework for the exploration and exploitation of minerals, for health and safety, and for the protection of the environment and the rights of local communities. In this policy-making process, all relevant stakeholders – governments, civil society, affected communities, indigenous peoples’ organizations, labour unions, industry and international organizations – must be given a chance to participate in order to avoid inequitable outcomes. Allocating an acceptable share of the revenues Allocating an acceptable share of the revenues to provincial and other lower levels of government can be a way to mitigate social conflicts in the local areas most directly affected by extractive activities. However, this also requires adequate governance systems and capabilities at the local-government level. … as are the regulations and contractual forms relating to TNC entry and operations. The way foreign involvement in extractive industries is governed has changed over time and still varies considerably by country. Approaches range from total prohibition of foreign investment in resource extraction (as in the case of oil in Mexico and Saudi Arabia) to almost complete reliance on TNCs (as in the case of metal mining in Ghana and Mali, or oil and gas extraction in Argentina and Peru). Various national laws, regulations and contracts govern TNC involvement. In addition, many countries have entered into international investment agreements (IIAs) of relevance to the operations and impacts of extractive-industry TNCs. In the oil and gas industry, TNCs operate under contractual arrangements of various kinds, such as concessions, joint ventures, production-sharing agreements (PSAs) and service contracts (table 8). Overall, as of June 2007, PSAs were the most commonly used form, accounting for more than 50% of all contracts with foreign TNC participation in the main oil- and gas-producing developing economies. They were the main contractual form in countries such as China, Equatorial Guinea, Indonesia, Iraq, the Libyan Arab Jamahiriya, Qatar, Sudan and Viet Nam. Concessions and joint ventures are the next most commonly used contractual forms, and the dominant ones in Algeria, Angola, Brazil, Kazakhstan, the Russian Federation and Venezuela. Service contracts are less common but are important, for example, in the Islamic Republic of Iran and Kuwait. The effect of a given contract depends on how its contents have been negotiated between the host State and the investor. Royalty and taxation rates are often contractually determined, as are issues related to local content, training, hostgovernment control over key decisions and the extent of participation of a Stateowned corporation, where applicable. More recently, contracts have also started to include provisions relating to human rights and environmental issues. In metal mining, companies obtain concessions in the form of licences, which give them the right to explore for and produce minerals. The conditions for investment are typically set out in a mining code or a mining agreement. Such codes have evolved over time, reflecting changing market conditions and political priorities. Common features of current mining laws include increased security of tenure, open access to historical exploration reports, more streamlined and transparent exploration application procedures, geographically defined exploration areas, provision for dispute resolution and methods for resolving conflict over land use. A number of countries also stipulate conditions related to the employment of domestic and foreign employees in the metal mining industry. In both the oil and gas and the metal mining industries, the evolving arrangements reflect an ongoing process through which governments seek to find an appropriate balance between the respective rights and obligations of States and firms. As government revenue is among the most important benefits from mineral extraction, it is not surprising that policymakers devote much attention to finding a mechanism that assures the government an appropriate share in the profits from mineral extraction. As the result of higher mineral prices in the past few years, a number of governments have taken steps to increase their share of the profits generated by amending their fiscal regimes or their contractual relations. Recent regulatory changes in developed, developing as well as transition economies suggest that many governments believed their previous regulations may have been overly generous vis- à-vis foreign investors. Compared with earlier waves of government policy changes and nationalizations, an added dimension this time is the wider use of IIAs among countries. While such treaties subject these governmental actions to certain international law principles, they cannot ultimately prevent a state from putting an end to a contractual relationship under existing terms. However, IIAs may grant foreign investors the right to claim compensation through international arbitration in case of a dispute. Protection under IIAs therefore mainly becomes relevant in the context of an exit strategy of a foreign investor. The scope of protection granted by such an agreement depends on how the treaty is formulated and its interpretations by arbitration tribunals. Moreover, the outcome of the government policy changes depends partly on the bargaining power of the parties. For those host countries that posses proven and high-value mineral and petroleum deposits, unilateral actions may be a viable approach to capturing a larger share of the benefits from an extractive industry. However, other countries may be in a weaker position to take such actions. In order to derive maximum economic gains from TNC involvement while keeping potential environmental and social costs to a minimum, concerted action by all relevant stakeholders is required, based on a consensus around coherent policies. A number of recommendations to host-country governments, home-country governments, the international community, civil society and TNCs emerge from the analysis in WIR07. Host-country governments bear the main responsibility for ensuring that the exploitation of their extractive industries yields benefits that support development objectives. Each government should formulate a clear vision as to how the country’s oil and mineral resources can contribute to sustainable development. In that respect, an overall development strategy, developed within a governance framework based on the rule of law, is essential for coherent policy formulation and implementation. It should consider all relevant stakeholders – both current and future generations. Governments also need to strengthen their ability and capacity to design and implement appropriate policies. Well-informed governments are in a better position not only to design an appropriate regulatory framework, but also to enter into negotiations with TNCs, where necessary. A clear strategy at both central and subnational levels of government indicating how to manage and use the revenue generated from mineral extraction is essential. Policymakers need to consider from the outset how to derive long-term and sustainable development gains from the extractive activities of TNCs. It is crucial that the revenue generated from mineral extraction be invested in activities to enhance productive capacities, including human-resource and technology development, with a view to strengthening domestic private sector capabilities. They should also promote to strengthening domestic private sector capabilities. They should also promote They should also promote backward and forward linkages within the extractive industries and with related industries. In designing and implementing policies, governments need to bear in mind the cost-benefit relationship, and the fact that mineral markets are volatile. If a country seeks TNC participation in its extractive industries, its business environment should be competitive to attract the desired investments and skills. To reduce the need for unilateral actions by governments, countries may need to develop frameworks that are robust over the different phases of the business cycle, for example by introducing progressive taxation systems for the fiscal treatment of revenues from extractive industries. Host-country governments should also consider the environmental and social consequences of extraction activities. There have been some encouraging developments in this area in recent years. An increasing number of countries are introducing environmental legislation, often with specific regulations for extractive industries. However, many countries still need to develop the capabilities to implement and enforce their environmental laws. The protection of the interests and rights of the people that might be affected by resource extraction is first and foremost a government obligation. Nonetheless, it is important for the various relevant stakeholders in a host country to be given the opportunity to influence the decision-making process so as to ensure equitable outcomes. An important factor in this context is the need to enhance transparency. In several countries, information about revenue is still treated as confidential, and foreign investors may be required to sign confidentiality or nondisclosure agreements. … the international community, civil society and the TNCs. The international community can also help promote greater development gains from resource extraction. International organizations can facilitate learning opportunities from studying and comparing the positive and negative experiences of different mineral-rich countries. Initiatives at the regional level might be useful. For example, it is worth exploring the scope for regional geological surveys and for establishing regional mining schools in Africa. In addition, the international community can be instrumental in the development of standards and guidelines and in promoting the use and adoption of existing tools to help ensure a more development-friendly outcome of TNC activities in mineral-rich countries, notably in weakly governed or authoritarian States. In very serious instances, the international community may have to explore sanctions as a tool for protecting human rights. Voluntary initiatives can also be a useful supplement in countries where appropriate legislation or its enforcement is absent. A number of multi-stakeholder initiatives have been established with the aim of reducing the risk of conflict-related resource extraction and setting standards for corporate behaviour in conflict situations. The most notable ones include the Extractive Industries Transparency Initiative, the Kimberley Process Certification Scheme, the Voluntary Principles on Security and Human Rights and the Global Reporting Initiative. Civil society has played an active role in promoting these initiatives. International as well as local NGOs can contribute expertise on economic and environmental as well as human rights issues; and they can play an important role in monitoring the actions both of governments and companies, drawing attention to any abuse or inappropriate actions. However, it is important for more countries and TNCs in extractive industries to become involved in these initiatives. When engaging in resource extraction, the role of TNCs should be, first and foremost, to contribute to efficient production while, as a minimum, respecting the laws of the host country. When mineral deposits are located in weakly governed or authoritarian States, foreign companies need to consider the implications of investing there or not. While there are no easy choices in this respect, a number of new tools – such as those for compliance assessment developed by the Danish Institute for Human Rights and for risk and impact assessments and screening produced by International Alert – can provide guidance. However, even among the largest enterprises, the number of extractive TNCs that have signed up to relevant international initiatives is still small. A review of the top mining and oil and gas TNCs shows that very few of them are explicitly committed to these initiatives, particularly companies from developing and transition economies. Until more companies participate in them and abide by their commitments, their impact will be limited. A concerted effort by all stakeholders is necessary to ensure that the vast mineral resources located in some of the world’s poorest countries become a force for development. In low-income, mineral-rich countries, TNCs are likely to play an active role in the mineral extraction. The challenge is therefore to develop frameworks that create the proper incentives for local and foreign firms to produce efficiently while at the same time respecting environmental and social requirements that reflect the interests of local communities and society at large. A win-win situation can result if various minerals are produced efficiently and if host countries, with the support of various other stakeholders, can make the revenues generated work more effectively for sustainable development and poverty alleviation. High prices of metals, oil and natural gas have led to increased activity of TNCs in extractive industries. The relative importance of foreign affiliates in mineral production varies by economy and mineral… … reflecting a diverse and changing universe of extractive industry TNCs, with the dominance of privately owned firms in metal mining and of State-owned enterprises in oil and gas. Varying motives drive the overseas expansion of different TNCs. TNC participation in extractive industries can have significant impacts on host economies … … including various economic impacts … … as well as considerable environmental, social and political impacts. Governance systems are important for maximizing development gains from resource extraction … … as are the regulations and contractual forms relating to TNC entry and operations. Ensuring greater and more equitable development gains requires shared responsibility among stakeholders, including host and home governments … … the international community, civil society and the TNCs.